Thanksgiving is just around the corner and as it's such a special time of year, many people give great thought to planning their Thanksgiving meal or, if being invited to eat with others, perhaps they're thinking of buying an appropriate gift for the host. If you are one of the latter, then here's a great idea for a Thanksgiving gift - a gourmet gift basket. Giving thanks for our blessings with a gift of food in any shape or form is always going to be a winner and if you know what your host and their family like to eat, then it's not that difficult to find just the right gift. 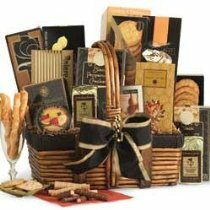 There are many gourmet gift baskets to choose from. Check them out now! Photo: 5 star rated gourmet gift basket available through the Ice Cream Recipes Online Store. If, on the other hand, you are the host and have a Thanksgiving meal to prepare, have you thought about making your own homemade ice cream for Thanksgiving? Check out my Thanksgiving ice cream recipes page for ideas. Go Political This Halloween - Costume Mask Fun!